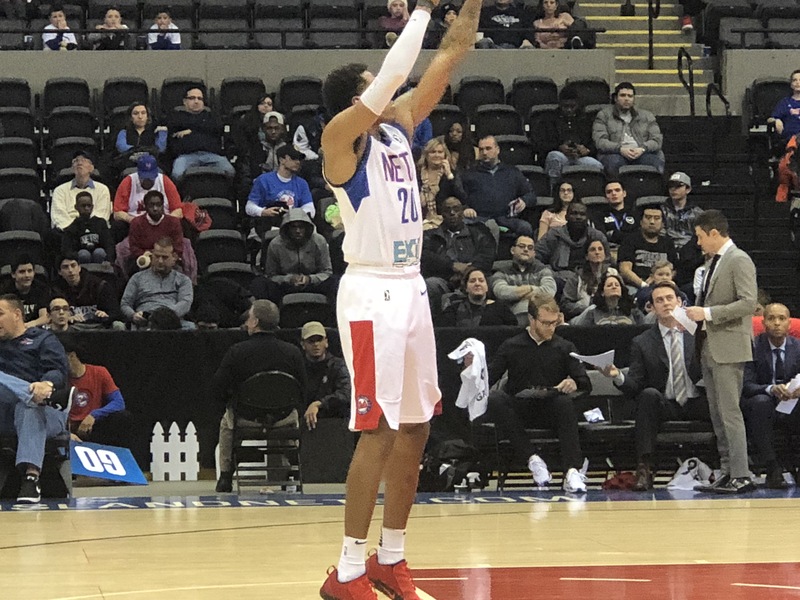 Christmas may have been a couple of days ago but the Long Island Nets gave fans a reason to be joyful with a win over the Erie Bayhawks. Coming off a loss to the Canton Charge Saturday, the Nets were looking to bounce back. The drama filed game changed from a potential blowout loss into a come from behind victory. The Nets showed their resiliency and strong bench in this Tuesday Night victory over the Erie Bayhawks. The Bayhawks came out the gates on attack mode and led majority of the game. With strong performances from, former NBA dunk contest champion Jeremy Evans who scored a team high 22 points (while shooting 8 for 9) and collecting 15 rebounds. Also by Raphiael Putney who scored 21 points and nailed 5 three pointers. Going into halftime things did not look good for the Nets after point guard Isaiah Whitehead went down with an injury and had to be helped off the floor. In the second quarter the Bayhawks score 33 points while the Nets 15. After the 1st half the Nets looked to take control of the game. They were able to end the 3rd quarter down only 11 points after being down 59-41 at the half. During the 4th quarter the Nets became the aggressors. Thomas Wimbush who scored 16 of his 27 in the fourth seemed to be able to do whatever he wanted. But this was far from just one player dominating he had help from teammate Jeremy Senglin who had a 16-point performance and shot the three that gave the Nets their first lead of the game. Another teammate who helped the Nets seize control of the game was Tahjere McCall who came up with 4 steals. With this victory the Nets are now 14-7 and hand the Bayhawks their 13th loss of the season. The Atlantic division leader look to close out the year with a win over their rival the Westchester Knicks Friday night. Ponyx Chery, Long Island University Journalism Major. My interest are sneaker collection, writing Poems listing to music and following College and NBA Basketball.